Card Artwork Sample Art from the Collectable Card Game. 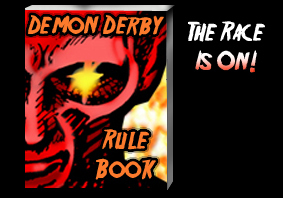 Rules Demon Derby - The Rules of the Game . 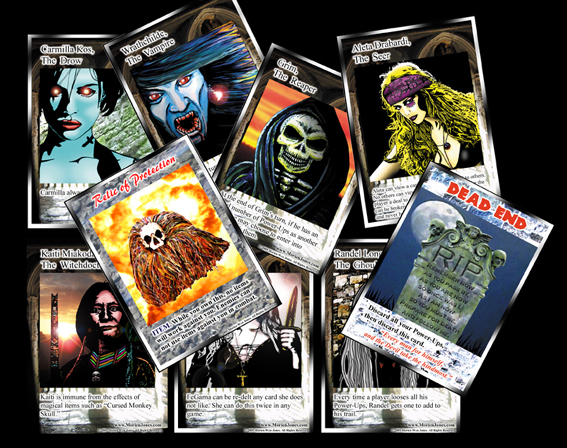 Demon Derby is a new and original Printable Card Game by Morien Jones. Dark creatures vie to become all-powerful and smite their challengers. The only safety lies in absolute power. The shadowy hand of the sinister underground supernatural guild, the 'Gothic Nostra' is at work here, and it’s time to select a new leader. There can only be one victor, and the losers pay with their lives. Bring forth a power-hungry character from your team of super-charged beings, and compete. Only one character can survive each round of the power-race. The play is quick and easy to pick up and may players can play. It also works as a solo game, if you don’t mind drawing cards for the “opponent”. Beneath the agony and glamour of our world, beats the dark heart of another world ... a veiled world. 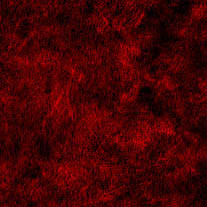 Everything is not as it seems. This is a world of magic and monsters, hidden from those whose eyes are not yet open to see. Pretenders plot and scheme. Beasts put on human skins and walk amongst us. Prowling our urban jungles are creatures of darkness, changing our perceptions to avoid our gaze. Hiding whilst in full sight. Beware, my friend, beware. One can smile … and smile … and be a villain. For something wicked is abroad. The game is free to print out and play, if you enjoy it please return and pay just £2.99. In return we will inform you when there is an expansion available, and you will be contributing to future game productions. The game Demon Derby is protected by Law. By download it you are agreeing to our Terms. Do not distribute the any part of this game as it severely jeopardizes future releases.